As we begin the second half of 2014, let’s take a look back at how equities and interest rates performed in the first half of the year. 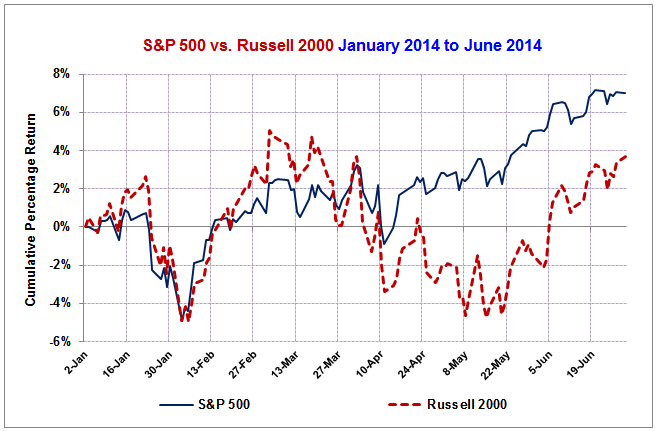 The first chart shows that U.S. large-cap stocks (the S&P 500) posted strong gains of about 7% in the first half, but small caps (the Russell 2000) lagged with a total return of just under 4%. 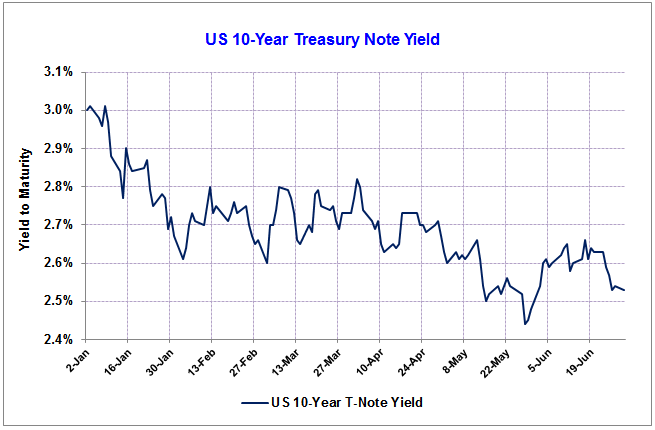 When large-caps lead small-caps we usually think the market is in a bit of a “risk-off” mode, which is confirmed by the gradual decline in the 10-year Treasury note yield, shown in the chart below. Despite the chants of “great rotation” from the financial media, the long-predicted rise in interest rates has not yet materialized. 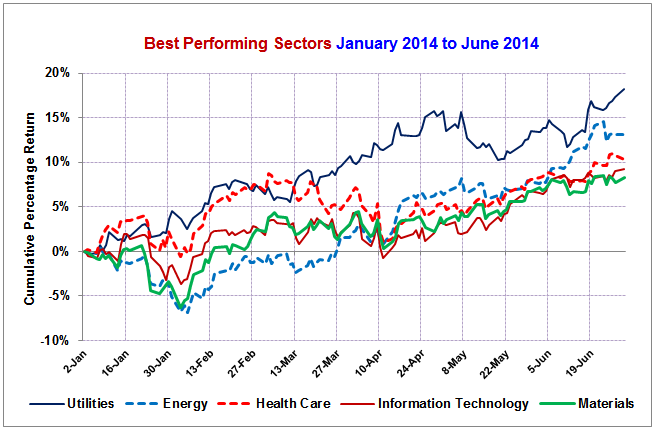 Overall, investors were handsomely rewarded in the first half of 2014, considering that U.S. stocks rose 30% in 2013. 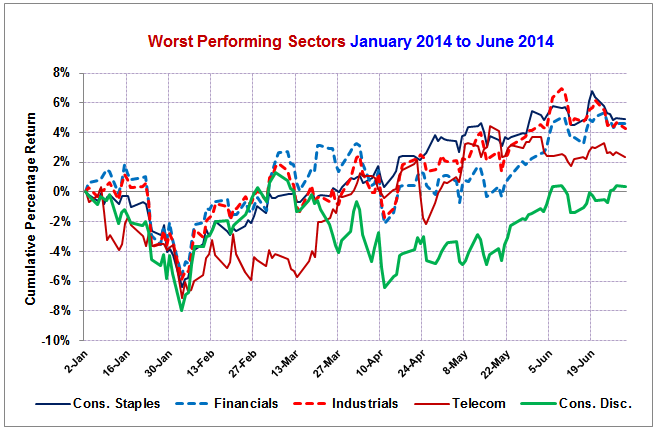 But the market’s internals are weakening, as investors repositioned to play defense in the second half of the year. Now that former doves like the St. Louis Fed’s Jim Bullard are arguing for the Fed to exit markets sooner rather than later, expect an immediate increase in volatility at the first sign that the Fed is actually backing off. But it’s important to note that thus far the Fed has only talked about accelerating the taper. As pointed out by Phil Davis today, the Fed continues timing its cash injections to aid end-of-quarter window dressing. 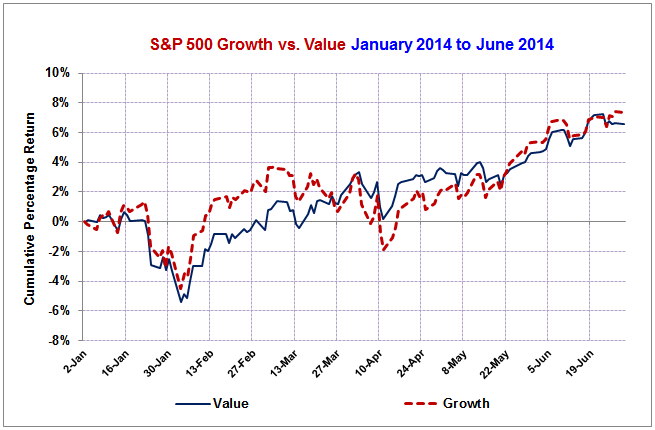 What would stock values look like in a market that was not supported by the Fed? It’s been a long time since we’ve had an answer to that question — so long that many have probably forgotten the concept altogether.